Pumpkins were a centuries old diet staple of Native Americans, who also wove dried pumpkin strips into mats. Early colonial settlers quickly discovered that pumpkin was a wonderful ingredient in soups, stews and pies. And when the Irish emigrated to America, they were amazed at how easy the pumpkin was to carve. Back in Ireland, they had used rutabagas, turnips, gourds and potatoes to carve their Hallow's Eve Jack O'Lanterns. Because of their greater size and softer flesh, pumpkins soon became everyone's favorite Jack O'Lantern. Unfortunately, many Americans only use pumpkins for holiday pie or Halloween decorations. But it is a highly versatile and nutritious vegetable. 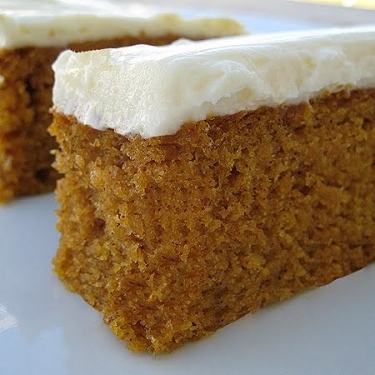 For a few ideas on how to enjoy pumpkins aside from October 31st or Thanksgiving, try some of the recipes below. You'll never look at that carved Jack O'Lantern the same way again. Don't let the custard's rich taste fool you. Because the recipe uses egg whites and fat-free evaporated milk, this is a delicious low calorie and low-fat autumn dessert. Each serving is only 125 calories, with just a trace of saturated fat. And Splenda brown sugar may be substituted for white sugar. Beat egg whiles, sugar, cinnamon, salt, ginger, cloves and nutmeg in a large bowl. Add vanilla and pumpkin to the bowl and mix well. Pour mixture into eight ungreased 6-oz custard cups. Place custard cups in a 9x13 inch baking pan. Add 1 inch of water to the pan. Bake 35-40 minutes at 325 degrees, or until knife inserted near the center of the custard comes out clean. Serve warm or chilled. Top with whipped cream if desired. Since I came across this recipe on the Land O Lakes website, it calls for Land O Lakes butter. However I am sure any brand of butter will suffice. As for me, I never use anything but Land O Lakes. Cook pasta according to package directions. Drain. Set aside and keep warm. Melt butter in 12-inch skillet until butter sizzles. Add chicken and garlic. Cook over medium-high heat, stirring occasionally. Cook until chicken is no longer pink in center, approx. 8-10 minutes. Add cooked pasta to the chicken in skillet. 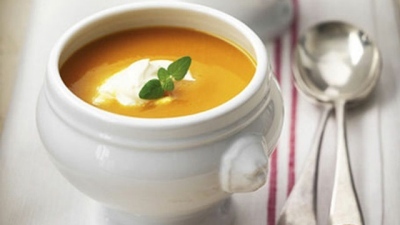 Combine chicken broth, pumpkin, whipping cream and salt in medium bowl. Pour pumpkin mixture over chicken and pasta. Cook over medium heat until heated through, 3-5 minutes. Sprinkle with chopped pecans just before serving. While carving this Halloween's Jack o'lantern, make certain to put the seeds aside after scooping them out of the pumpkin. One of the season's tastiest treats, roasted pumpkin seeds are also one of the easiest to make, And don't forget there are 7 grams of healthy fiber in each serving. Remove as much pulp and strings from the seeds as possible. Rinse under cold water if necessary. 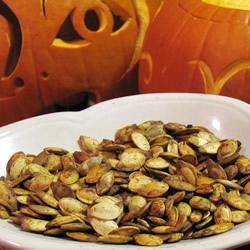 Toss pumpkin seeds in a bowl with melted butter or oil. Add seasoning of your choice. Spread pumpkin seeds in a single layer on a baking sheet that has been coated with cooking spray. Bake until toasted and golden brown, approx. 25 minutes. Stir occasionally while baking. Remove seeds from tray with a spatula. Let cool, then store in air-tight container. Starbucks fans rejoice! Now you don't have to pay $3.00 for your pumpkin spice latte, or have to wait for autumn to sip this popular coffee drink. For those who do not own an espresso machine, substitute strong coffee for the espresso. To do that, simply add double the amount of coffee grounds normally used for a large cup of coffee. And if you don't own a blender, simply whisk the latte mixture with a wire whisk. Brew espresso or strong coffee. 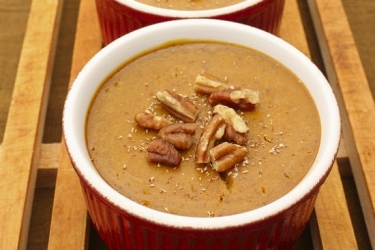 Combine milk, pumpkin, pumpkin pie spice and sugar in a saucepan. Cook on medium heat while stirring until mixture steams. Do not boil. Transfer mixture to a blender or milk frother. Blend until foamy, approx. 15 seconds. Pour into one large mug or two smaller mugs. Add the espresso or coffee shots on top. 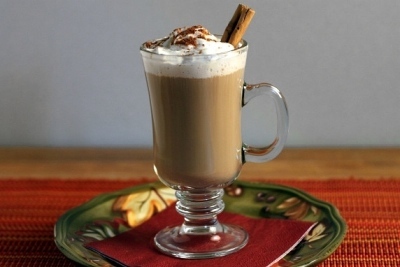 May top with whipped cream, adding nutmeg, cinnamon or pumpkin pie spice on top. Here's a perfect fall dessert when you have eaten more than your share of cinnamon donuts from the cider mill and leftover Halloween candy. Btw, the Food Network website gives this recipe Five Stars. Thanks, Paula. And thanks to Patty Ronning, the woman who Paula adapted the recipe from. Preheat oven to 350 degrees F. Grease a 13 x 10-inch baking pan and set aside. an electric mixer at medium speed, beat eggs, oil, pumpkin and sugar in a mixing bowl until light and fluffy. In a separate bowl, stir together the flour, cinnamon, baking powder, salt and baking soda. Add the dry ingredients to the pumpkin mixture. Mix at low speed until the batter is smooth and all ingredients are completely blended. Bake 30 minutes, or until a toothpick inserted in center comes out clean. Let cool before frosting. Cut into bars. Combine cream cheese and butter in a bowl. Beat with electric mixer until smooth. Add sugar, and beat at low speed until combined. Stir in the vanilla extract. Mix again. Once the gentle days of Indian summer are gone, and the trees have lost all their leaves, we start to feel the chill of late autumn. Now is the time to pull out wool jackets and favorite soup recipes. 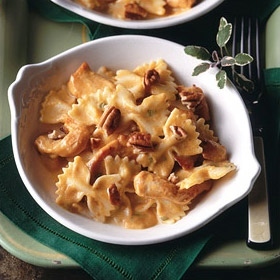 Once you taste this creamy, flavorful dish, be prepared for it to become a cold weather favorite. Over medium-high heat, melt butter in a 4-quart saucepan. Stirring often, add onions and garlic and cook until softened, approx. 4 minutes. Add spices and stir for one minute more. Add pumpkin and 5 cups of the chicken broth; blend well. Bring mixture to a boil and reduce heat. Simmer 10-15 minutes. Transfer soup in batches to a food processor or blender. Cover tightly and blend until smooth. Return soup to saucepan. With the soup on low hear, add brown sugar and mix. Slowly add milk while stirring. Add cream. Adjust seasonings to taste. If too tasty, add more cream to cool it down. Add a teaspoon of salt if needed. Sprinkle the top of each serving with toasted pumpkin seeds. *Pumpkin puree: Cut a sugar pumpkin in half. Scoop out seeds and stringy pulp. Place the pumpkin halves face down on a tin-foil lined baking pan. Bake at 350 degrees F until soft, approx. 45 minutes to an hour. Cool. Scoop out the flesh. Freeze whatever you don't need for future use.